You may have received the following email, addressed to “Dear beneficiaries”, and signed “UNJSPF”, which appears to have been sent to all UN retirees worldwide, attaching the FAFICS president’s “update” dated 8 January 2018. This is a “comprehensive update” sent on behalf of FAFICS. 2. I also emphasized that “the FAFICS president’s [has] demonstrated unconditional support for the CEO including (i) writing an email to OIOS on 1 June 2016 discouraging the audit of the backlog in pension payments which has caused untold suffering to new retirees and other beneficiaries; (ii) pushing for his advance reappointment in 2016 based on an outdated performance evaluation; and again for a renewed five year term in 2017, while disregarding the accumulated information contained in the reports of UN governing bodies and OIOS audit 2017/002 concerning the role of mismanagement in the Fund. 3. It is impossible to discern from the email purportedly sent from the Fund today, using its confidential member contact information, by whom this email was sent, and on what authority. In fact, one has no way of knowing whether this communication, sent on Sunday, a day when the Fund is closed, at 6.59 am, is the result of a breach of IT security. 5. That being said, given the pattern of abuse of power, self-interest and manipulation of information demonstrated by elements of the Fund leadership and the FAFICS president, this appears to be yet another example of desperation in the form of collusion to propagate misinformation in the face of recent actions by the UN Secretary-General and the General Assembly to address problems besetting our Fund. 6. The Secretary-General and the Fund’s leadership are entrusted with safeguarding our life savings. The FAFICS president is entrusted with representing the interests of UN retirees worldwide. Elements of the Fund’s leadership and the FAFICS president have consistently betrayed this trust by providing mutual support and dissemination of distorted information directly to Fund and FAFICS members, and by posting such communications on the Fund’s and the FAFICS websites. 7. In doing so they continue to demonstrate a clear disregard of their accountability and responsibility to us, the Fund’s beneficiaries and participants who are in reality, the Fund’s owners. 8. I take this opportunity to restate the following from my 14 January note: “Many of the developments initiated by UN governing bodies and the Secretary-General in recent weeks have been positive. Nonetheless, progress will depend on the good faith efforts of those in positions of authority and trust to ensure proper implementation”. 10. I request that you kindly share this communication with your members. Thank you. Further to my communication of 4 January 2018, I wish to draw your attention to several instances of misinformation and distortion of facts contained in the FAFICS president’s “update” of 8 January 2018. As you’re aware, FAFICS holds four seats (plus two alternate seats) on the Pension Board, without voting rights. The FAFICS president sits on the Board as the representative of UN retirees worldwide. From this position of authority and influence, she has demonstrated, as in this “update”, a pattern of partisanship, non-transparency, manipulation of information, and attempts to discredit anyone who questions or opposes her actions. Response: The Board, at its 2017 session, in recommending the CEO for a five-year and eventual three-year reappointment, had the benefit of three brief paragraphs (25 to 27) in the report of the Audit Committee dated 12 July 2017 pertaining to the Committee’s consideration of OIOS audit 2017/002 (70 pages with appendices) on the role of mismanagement in the unprecedented backlog in pension payments. The Committee, rather mildly, (quote from para. 27) “[took] note of the improvement in benefit processing…. noted that the Fund defined actionable cases as those where all the required documents had been received …[and] continued to believe that additional work is needed to provide an accurate inventory of workflows elsewhere in the pipeline.” A scant three months later, on 11 October 2017, OIOS audit 2017/104 on post-IPAS implementation detailed many of the same unresolved issues as reported in audit 2017/002. Response: The Board is a subsidiary of the General Assembly. The Assembly has the authority, without prior discussion or debate in the Board, “to request the Secretary-General to entrust the Office of Internal Oversight Services with conducting a comprehensive audit of the governance structure of the UN Joint Staff Pension Fund Board, to include a review of the checks and balances between the Board and the Pension Fund leadership” (para. 8 of GA resolution A/RES/72/262). The FAFICS president may address any concerns directly to the General Assembly. Response: Nowhere is it stated that the backlog was about “missed payments for [existing retirees].” It was always about unprecedented delays in payments for new retirees and staff separation cases, survivors, and other beneficiaries. Response: There was indeed a positive preliminary evaluation of the CEO conducted in 2015 by the bureau of the 62nd session, based on the 2013-2014 performance period (see para. 375 of the 2016 Pension Board report (A/71/9)), the session at which some members of the Board, including the FAFICS president attempted to push through an advance reappointment of the CEO for five years. The evaluation appears to have been deliberately based on the period before the role of mismanagement in the Fund secretariat was documented in OIOS audit 2017/002 of the pension backlog (dated 13 February 2017). The same outdated performance evaluation appears to have been considered at the Board’s 2017 session when a failed attempt was again made to push through a five-year reappointment of the CEO. Response: That the Secretary-General’s representatives on the Board, i.e., the UN Executive heads, stood with the UN participant representatives on the issue of no reappointment of the CEO should not have been a “surprise” to anyone on the Board. OIOS had duly documented in its audit 2017/002 of 13 February 2017 the role of mismanagement in the backlog in pension payments. Other reported mismanagement in the Fund secretariat, in implementing IPAS and irregularities in contracts and procurement, were subsequently borne out in OIOS audits 2017/104 dated 11 October 2017 and 2017/110 dated 31 October 2017. The CCISUA President, whom the FAFICS president characterizes as a “leading critic of the Pension Fund, the CEO and governance structure of the Pension Board” heads an organization that together with other UN staff associations, FICSA and UNISERV, represent 110,000 participants of the Fund. CCISUA has stood firmly with the other staff associations in representing the interests of their constituents (active UN staff) against mismanagement in the Fund secretariat and lax oversight by the Board, as borne out and documented in the reports of UN governing bodies and OIOS audits. In doing so, and by default, the UN staff unions have filled the vacuum left by FAFICS in effectively representing the overlapping interests of UN retirees. Response: As stated above, the FAFICS president’s uses terms such as “disgruntled” and “unprincipled” to disparage and discredit anyone who questions or criticizes her actions and manipulates information so as to depict the statements of others as “spurious” (false). Moreover, she should state the “standing” she believes is required in order to have the right to share and comment on the reports of UN governing bodies, internal audits, and other documents pertaining to the health of our Fund, beyond that of a retired UN staff member (with 37 years of service), a UNJSPF member for 46 years, and a dues-paying member of AFICS/NY in good standing. She should also state where and when I have claimed to represent anyone. The FAFICS website should reflect a fraction of the transparency of the pension blog, which has meticulously documented all reports and other relevant communications relating to the Fund since the beginning of 2015. Response: “Lend its support” does not adequately describe the FAFICS president’s demonstrated unconditional support for the CEO including (i) writing an email to OIOS on 1 June 2016 discouraging the audit of the backlog in pension payments which has caused untold suffering to new retirees and other beneficiaries; (ii) pushing for his advance reappointment in 2016 based on an outdated performance evaluation; and again for a renewed five year term in 2017, while disregarding the accumulated information contained in the reports of UN governing bodies and OIOS audit 2017/002 concerning the role of mismanagement in the Fund. Regarding her claim that she’s “viciously attacked” see my response (10) above. “Our knowledge and experience of what is truly transpiring” is obtuse language indicating that either a) the FAFICS president believes that she and her cohorts are privy to knowledge that contradicts what the rest of us are reading in the reports of UN governing bodies and OIOS audits; or b) that her own dearly held personal views are all that count. Response: The FAFICS president appears to believe that “our considered opinion” takes precedence over OIOS audit 2017/104 on post-IPAS implementation that directly contradicts reports made by the CEO to the Pension Board in 2016 and 2017 that the system was working successfully. It also contradicts a largely positive report from July 2016 by PraceWaterhouseCoopers (PWC) on IPAS implementation and other issues which the CEO presented to the Board. Among the OIOS audit’s findings are that project costs of the system have more than doubled; weaknesses in the system have increased manual processing; the system and its infrastructure may be susceptible to security breaches; and a majority of top-priority benefit types (survivor, disability, and reinstatement benefits) were not included in testing of the system before it was launched. Response: Nowhere has it been stated that there are “thousands of unpaid widows and orphans”. Instead what has been reported accurately, is that there are thousands of unpaid beneficiaries remaining, including widows and orphans. Response: The FAFICS president’s actions in systematically withholding, manipulating and selectively sharing information, both in her current position and as president of AFICS/NY, has nothing to do with “limited administrative resources” and everything to do with her determination to limit transparency by strictly control the flow of information, and suppress criticism. The FAFICS website, and the AFICS/NY website noticeably include only Fund newsletters, AFICS and FAFICS communications (to, but not from, her constituents), and none of the relevant General Assembly resolutions, reports of UN governing bodies or OIOS audit reports. Throughout her “update”, the FAFICS president attempts to distort information, confuse her readers, and deflect attention away from the substantive issues at hand. I urge FAFICS members and associate members to resist being distracted by distortion of the essential facts: As a result of problems besetting both sides of the Fund as detailed in two General Assembly resolutions (A/RES/71/265 and A/RES/72/262), reports of the Board of Auditors (A/71/5.Add/16 and A/72/5/Add.16) ACABQ reports (A/71/621 and 72/7/Add.23), and OIOS audits (2017/002, 2017/104 and 2017/110), the Secretary-General decided to replace his Representative for Investments, and to reappoint the CEO for a final three-year term while making his continuation subject to performance monitoring, in effect, placing him on probation; and the General Assembly has “Requested the Secretary-General to entrust the Office of Internal Oversight Services with conducting a comprehensive audit of the governance structure of the UN Joint Staff Pension Fund Board, to include a review of the checks and balances between the Board and the Pension Fund leadership”. Over the past three years plus, the FAFICS president has played a key role in actions with the potential to negatively affect the health of our Fund, including: (i) supporting increased autonomy for the CEO in staff-management, financial and procurement matters; (ii) participating in evaluating the CEO’s performance positively and pushing for advance renewal of his contract in 2016 and again in 2017, without reference to information of which she was certainly aware concerning the role of mismanagement in the Fund secretariat, borne out in reports of UN governing bodies and OIOS audits 2017/02, 2017/104, and 2017/110; (iii) writing to OIOS on 2 June 2016 discouraging an audit of the backlog in pension payments which caused untold suffering to new retirees, beneficiaries and survivors, in which she questioned the need for and timing of the audit, the definition of “backlog”, described the reported delays as “anecdotal”, and lamented the “noise from [the staff unions that] has clouded the issue and served only to spread fear and anger”; (iv) failing to consulted FAFICS members about positions taken at the Pension Board; (v) consistently dismissing concerns expressed by her constituents; including, as president of AFICS/NY, declining to hold consultations when requested, in writing, under the bylaws; (v) manipulating information, attempting to silence dissent, and publicly disparaging her critics as a way to discredit them. Indeed, in this “update” the FAFICS president maligns the head of the Coordinating Committee for International Staff Unions and Associations (CCISUA), and the UN participant representatives to the Pension Board of which he’s a member. She expresses “surprise” at the action of the representative of the UN Executive heads (the Secretary-General’s representatives on the Board) in standing with the UN participant representatives in opposing any reappointment of the CEO. Moreover, she questions the Secretary-General’s authority to appoint the CEO; and the General Assembly’s authority to request “a comprehensive audit of the governance structure of the [Board] to include a review of the checks and balances between the Board and the Pension Fund”. Many of the developments initiated by UN governing bodies and the Secretary-General in recent weeks have been positive. Nonetheless, progress will depend on the good faith efforts of those in positions of authority and trust to ensure proper implementation. In summary, the FAFICS president has failed time and again to demonstrate the essential qualities of impartiality, transparency, discipline and temperament required for effectively carrying out the functions of the office. The FAFICS president will not voluntarily relinquish her position. For the sake of the continued health of the Fund, I urge FAFICS members and associated members to independently assess the facts and take the necessary action to ensure that FAFICS has the caliber of leadership that enables it to assume its important role in effectively representing the interests of UN retirees worldwide. I have been awaiting the outcome on decisions taken on matters of interest and concern regarding the Pension Fund and am pleased to be able finally to update you in a comprehensive way. The General Assembly adopted on December 24, 2017 Resolution 72/262, a draft advance copy of which you should have received by now, but is also attached to this letter for easy reference. Although last year was a so-called budget year, the resolution did not restrict itself, as had been customary, to budget matters and the Board of Auditors report. Instead, it extended its focus to include other matters such as investments and in particular, a call for a comprehensive review of the governance structure. The section on the Board of Auditors reflects that Board’s very significant issuance of an unqualified audit opinion on the financial statements, although it did call for some improvements in internal controls, timely processing rates, creation of a client grievance mechanism and faster implementation of recommendations. The unqualified opinion from the external auditors is a clear and important response to critics who continue to impugn the Fund’s probity. It is regrettable that misinformation with respect to OIOS reports, which are issued by internal auditors, was later disseminated by some UNSPC participant representatives, requiring the Chair of the Pension Board’s Audit Committee to recall that the Audit Committee had the delegated responsibility for dealing with internal and external audit issues, stressing that the audit process did not end with the issuance of the reports, as the Committee monitors implementation of the recommendations and mediates in cases where the auditors and managers disagree on findings and recommendations. FAFICS appreciates the work of both the external and internal auditors, along with the work of the Pension Board’s Audit Committee, and encourages the CEO and the Secretary-General to act expeditiously on appropriate audit recommendations. The core element in the resolution was the proposed budget for the biennium 2018-2019 as recommended by the UNJSPB. The Fund budget approved by the GA for 2018-2019 amounts to $195,259,800 (after recosting). This is equivalent to an increase of $10.2 million being 5.6 per cent in real terms. The General Assembly chose this year to make its own determinations on future budget levels and merely noted the ACABQ recommendations, while approving a lower level of resources than had been sought by the UNJSPF. It was also lower than the ACABQ recommendations. The cut in the proposed 2018-2019 budget is estimated at some $3.6 million being 1.9 per cent of requested resources. Apart from the across-the-board 5 per cent non-post cut mandated by the resolution, adjustments to the requested staffing table were also made. Just 4 of 9 recommended new posts were approved; 5 were denied including 4 for Client Services and Outreach (1 D-1, 1 P:-5 and 2 P-3s). One P-3 Benefits Officer post for Operations was also denied. Even though the revised budget represents a real increase of 5.6 per cent at the same time that the regular budget of the United Nations is being downsized, FAFICS regrets the cuts because they will hurt the client service and communications proposals made by the Board. The cuts in client servicing proposals are especially disappointing to FAFICS, particularly now when the Fund has been experiencing an increased caseload of retirees, increased longevity (with the related problems of infirmity, dementia, widowhood, etc.) and when client services should clearly be augmented. The paradigm has shifted with the increased numbers of retirees and the days of minimal client servicing costs are long gone. That is why FAFICS has strongly and consistently advocated for the strengthening of Client Services over the years and regrets the outcome in this regard. Regarding the call for a comprehensive review of the governance structure referred to earlier, we would advise that the wording calls for careful attention as the resolution refers to the governance structure of the Board, not the Fund as a whole. It may reasonably be questioned as to whether the General Assembly, without prior discussion in and substantive debate by the Pension Board, is indeed able to undertake a governance review of the structure of the Pension Board. FAFICS will be vigilant in this regard and resist attempts, as already articulated by some, to side-line FAFICS, restrict the influence of the specialized agencies and centralize control under the UN Secretary-General. Under Fund operations, IPAS is cited along with the need to improve processing times to avoid continuing process delays, but 2.5 years after the implementation of IPAS, these delays are largely a thing of the past. With respect to the paragraphs on expenditures, vacancies and service centers for Africa and Asia, FAFICS welcomes and endorses the thrust of the resolution in these matters. Insofar as investments are concerned, it is the Secretary-General alone who has responsibility for them, which is why mention of his key fiduciary role, lest we forget, is included in the resolution. The relevant paragraphs in the resolution endorse other established positions regarding rates of return, trading activities, exchange rates, external fund managers, advisers and composition of the Investments Committee. No reference was made to the Deloitte study as the results were not presented to the General Assembly in accordance with established practice to focus on budget matters in odd calendar years. Nevertheless, FAFICS will expect the RSG to report on progress achieved at the July 2018 session of the Board. As we already reported last fall, you are aware that at last summer’s Pension Board session extension of the contract of the CEO for a second five-year mandate was on the agenda. The previous year there had been a positive preliminary evaluation of the CEO after four years. 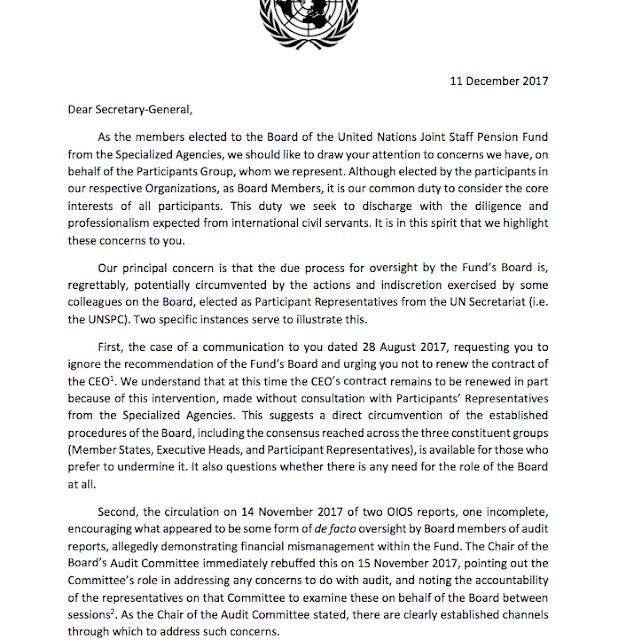 Although the five-year extension was unanimously supported by the representatives of the Governing Bodies, it came as a surprise that the representative of the United Nations Executive Heads together with the participant representatives on the United Nations SPC (of which the CCISUA President is a member and leading critic of the Pension Fund, the CEO and governance structure of the Pension Board), and a small minority of other Board members opposed any extension. The Board eventually came to a consensus for a three year extension. 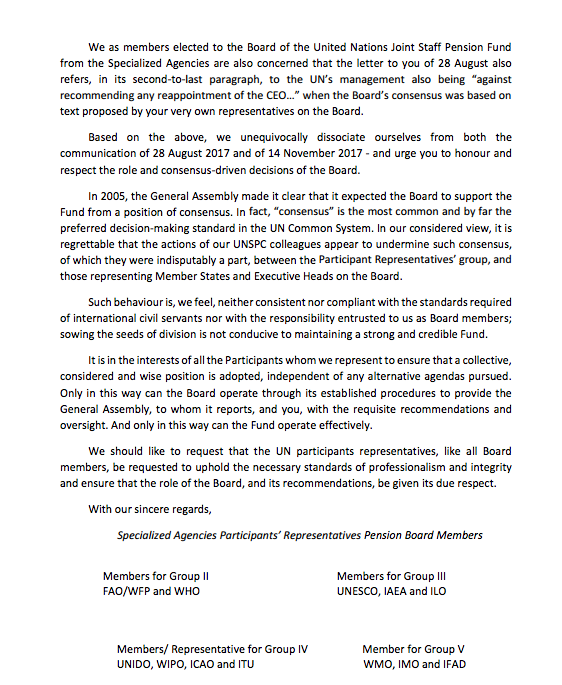 Subsequently, the participant representatives on the UNSPC, in violation of the consensus to which they were party, began to campaign against it on social media and elsewhere and to actively lobby the Secretary-General not to extend the CEO; reportedly led by the three Headquarters-based participant representatives, they wrote to him after the Board session on 28 August 2017 to urge him to ignore the recommendation of the Pension Board and continued to push an anti-Board, anti-CEO platform. Although the Pension Board has sole authority for the appointment and renewal of the CEO, the Secretary-General has the administrative function to issue the contract, which he eventually did at the eleventh hour on 29 December 2017 for a three year term, as per the Board’s consensus. Attached to this note is a letter sent to the Secretary-General by Participants Representatives Pension Board Members objecting to the tactics employed by this increasingly unpopular minority group. The Secretary-General’s action on extending the CEO was so badly received by some members of the UNSPC that they began a new campaign through a surrogate contending that the extension was “probationary” and falsely claiming that the Secretary-General told the Pension Board to “do its job”. The Secretary-General did not say that, nor did he issue a probationary appointment. Had he done so, moreover, it would have been functionally inappropriate. While there is every reason to monitor the performance of senior officials, it would be counter-productive to limit their ability to function by labelling their appointments probationary, which is why there is no precedent for such a mechanism. Such a policy would reduce initiative and a preparedness to take reasonable risks at a time when innovation and commitment are needed. The UNJSPB will continue to fulfil its responsibilities of overseeing the work of the CEO consistent with the decision it took to recommend a three year extension. FAFICS would not like to see additional operating constraints placed upon the CEO who should be free to serve the Fund to the best of his ability. At this point, a word is in order about communications which some of you may have recently received. As you know, for the past several years, FAFICS has for the most part deliberately ignored the malicious and ill-founded assertions about the Pension Fund and its CEO that have been circulating on social media. Indeed, both the Fund and the CEO have been subject to a trial by social media that is unprecedented in its vitriol and ad hominem attacks. When asked, although by now most of you are wise enough not to trust the messenger, we have been advising you to ignore these spurious communications. Now, because FAFICS members have been contacted, we would simply advise you to continue to ignore them. They are written and sent by a disgruntled and unprincipled individual who has no standing in FAFICS, the Pension Fund, or any other part of the United Nations system, and represents no one. The chief function of this self-appointed individual is to act as a surrogate for some members of the UNSPC, its leader in particular, and is adept at manipulating facts in such a way that they bear little relation to reality. Their joint campaign has been entirely negative with no thought to the harm being caused not only personally, but, more importantly, institutionally. Because FAFICS has continued to lend its support to the CEO, FAFICS and I personally continue to be viciously attacked as if we were purposely and perversely supporting an official we knew to be incompetent. Surely, our knowledge and experience of what is truly transpiring in the Fund and how the CEO has been operating would not permit us to follow such a course, so we would simply remind these critics that no one is perfect and what matters in the end is deliverables. It is our considered opinion that IPAS has so far been largely successful with the exception of some unfortunate delays during the first year of its rollout, delays which have now been largely corrected. We would also recall that the priority of IPAS for the first month of its rollout was the seamless continuation of the payment of pensions to existing retirees; this was a success and there was not a single report of missed payment for this group. Finally, we would caution you to take with a big grain of salt the continuing false reports of thousands of unpaid widows and orphans, a number being put forward by these same critics and one which is patently absurd. We would only say in this respect that in the five years pre-IPAS, the annual rate of widow/widower awards was somewhere between 120 and 160, and given those numbers, it would be clearly impossible to have accumulated “thousands” of unpaid widows since then. In a related matter, some of you may have heard that the Deputy CEO has decided not to seek a second mandate and agreed to retire after the next Board meeting in July instead of in June as he had originally wanted. FAFICS appreciates that he put the Fund ahead of his own personal plans and preferences by agreeing to stay on and see the Board through its next session. The Chair of the Board has already started to put a selection committee together which will include FAFICS, as was the case in the past for the selection of both the DCEO and the CEO. You will not be surprised to hear that the same UNSPC member is already campaigning in the Board against the inclusion of FAFICS on the selection committee and the reasons are obvious---FAFICS cannot and will not agree to the ongoing and undeserved vilification of the Pension Fund and the CEO which have been so personally and institutionally damaging. Lastly, some of you have said that FAFICS should provide copies on its website of various reports such as those of ACABQ, the Board of Auditors and OIOS. We would point out that all of these reports are publicly available on the UN.org website where they originate. FAFICS has limited administrative resources, so we would urge you to look for the reports you need on the UN website and if you don’t find them, contact the FAFICS Secretary for copies. In closing, we would suggest that you draw your membership’s attention to the December 2017 Newsletter of the Pension Fund which contains a wealth of accurate information. In closing I would like to wish you, your members and families renewed good wishes for the coming year which FAFICS faces with optimism and continuing confidence in our shared mission to maintain and protect retiree entitlements.